Regardless of your destination, before you get there, you can know, rest and trust in the fact that God is already there. You cannot go anywhere in this life where God is not waiting for you to get there. It is impossible to go ahead of him, to beat him to the punch or step out of his plans for you. In good times and bad, please know that God is ahead of you, waiting on you and ready to take care of you. In Exodus, God was disrupting an entire nation. The Israelites were being made aware that things had to change. There was turmoil in their land. They were in dire straits. The famine had spread beyond discomfort and families were struggling to make ends meet. From their perspective they were living in the moment and there was little hope for change of circumstance. It was not clear as to what they should do to resolve their problems. From their limited understanding they had no idea of the plans God had made for them. They could only see their trouble, their present situation. In Exodus 1:5 the writer is letting us know that the Israelites are in process of leaving their homes and heading to an unknown place. Though the text does not say I’m sure some of them were struggling with the stirring of their nest. They were being made uncomfortable and most certainly some of them were wavering in their faith about these upheavals of circumstance. Have you ever been in a place where God was re-altering your life? Have you ever stood in the moment of difficulty and seemingly all perceived options seemed to be lined with personal suffering and difficulty? If so, then you can somewhat understand what the children of Israel were going through. They were leaving all they knew. This was a total lifestyle change. People, places and things were being thrown under the bus and life was being radically altered and there was nothing they could do about it. They were being moved to another place by difficult circumstances. It was in this time and place that the writer inserts five little words into the text: Joseph was already in Egypt! This is more profound than just placing a GPS on Joseph’s backside to let the other Israelites know where their relative was located. Most certainly Joseph was found and his new diggs in Egypt became their new diggs. But it is more than that. This story is also about the how and why Joseph was in Egypt. As you begin to unpack Joseph’s prior circumstances, troubles and journey to Egypt you get the idea that something bigger than suffering was going on here. Then as you read about his rise to prominence and the ensuing famine in the land and the discomfiting of an entire nation, you begin to get a glimpse of God’s kindness to his children through their personal suffering. Can you see God’s kindness through your suffering? Are you aware that God is ahead of you? Do you know that your Father is planning, positioning, removing and inserting his necessary plans to take care of you? It took the Israelites a long time to realize that Joseph’s relocation to Egypt was orchestrated by the divine and loving hand of God. Regardless of your situation, I can most assuredly tell you that God is already there! Are Evil And Suffering God’s Will? “Thy will be done, on earth as it is in heaven” (Matt. 6:10). Many people assume that somehow everything that happens is God’s will. But that’s not true. Lives destroyed by murderous aggressors and families broken by adultery aren’t God’s will. Children and adults ravaged by abuse or crippled by disease aren’t God’s will. He uses sin and illness to accomplish His own purposes (Rom. 8:28), but they aren’t His desire. Eventually God will destroy all evil and fulfill His will perfectly (Rev. 20:10-14), but that hasn’t happened yet. That’s why we must pray for His will to be done on earth. We can’t afford to be passive or indifferent in prayer. We must pray aggressively and not lose heart (Luke 18:1). That’s how David prayed. His passion for God’s will compelled him to pray, “Make me understand the way of Thy precepts, so I will meditate on Thy wonders. . . . I shall run the way of Thy commandments, for Thou wilt enlarge my heart. Teach me, O Lord, the way of Thy statutes, and I shall observe it to the end. Give me understanding, that I may observe Thy law, and keep it with all my heart. Make me walk in the path of Thy commandments, for I delight in it” (Ps. 119:27, 32-35). But David also prayed, “Let God arise, let His enemies be scattered; and let those who hate Him flee before him. As smoke is driven away, so drive them away; as wax melts before the fire, so let the wicked perish before God. But let the righteous be glad; let them exult before God; yes, let them rejoice with gladness” (Ps. 68:1-3). He loved God’s will, but he also hated everything that opposed it. When you truly pray for God’s will to be done, you are aggressively pursuing His will for your own life and rebelling against Satan, his evil world system, and everything else that is at odds with God’s will. Pray for wisdom to see beyond your circumstances to what God wants to accomplish through them. Joni Eareckson Tada might be mistaken for a modern-day Job. The disabilities advocate was severely paralyzed in a diving accident at age 17. For the past ten years, she has endured chronic pain. Now, at age 60, she confronts breast cancer. Sounding upbeat and confident after surgery, she spoke with Christianity Today about her latest book, A Place of Healing: Wrestling with the Mysteries of Suffering, Pain, and God’s Sovereignty, where she outlines her theology of suffering. How has your perspective on suffering and healing changed since your breast cancer diagnosis? Thankfully, it hasn’t changed at all. You examine Scripture again and follow every passage regarding healing. I did that with my quadriplegia, and I did that again 10 years ago, when I embarked on a whole new life of chronic pain. Just a month ago, getting diagnosed with breast cancer, I looked at those same Scriptures, and God’s words do not change. Even though it seems like a lot is being piled on, I keep thinking about 1 Peter 2:21: “To these hardships you were called because Christ suffered for you, leaving you an example that you should follow in his steps.” Those steps most often lead Christians not to miraculous, divine interventions but directly into the fellowship of suffering. In a way, I’ve been drawn closer to the Savior, even with this breast cancer. There are things about his character that I wasn’t seeing a year ago or even six months ago. That tells me that I’m still growing and being transformed. First Peter 2:21 is a good rule of thumb for any Christian struggling to understand God’s purposes in hardship. Can you elaborate on new ways you think about God’s character? The thing that Jesus was doing wasn’t necessarily the miracles. He was giving the gospel; he was advancing his kingdom; he was reclaiming the earth as rightfully his. When Jesus gave that promise, he was saying, “I’m giving you a job to do, my Father and I want the gospel to go forth, and I promise you’ll have everything you need to get that job done, and you’ll do an even better job than me.” Jesus ministered for three years, and at the end, he had a handful of disciples who half-believed in him. After Jesus went to heaven and the Holy Spirit came down—my goodness, Peter preaches one sermon and thousands believe. That’s the greater thing that God wants us to do. That’s what I have been seeing this past month. Every x-ray technician, every nurse, every doctor’s secretary, every clinician, every person I meet in nuclear medicine and at the MRI—it’s amazing how many opportunities I’ve been given to see people hungry and thirsty for Christ. I knew that was true before, but there seems to be something special that is accompanying this diagnosis. I’m just so amazed by people asking me, “How can you approach this breast cancer with such confidence in a God who allows it?” And I’m being given the chance to answer. The greater thing is not the miracle; it’s the advancement of the gospel, it’s the giving of the kingdom, reclaiming what is rightfully Christ’s. You have hinted at a classic question: How can a good God allow such suffering in the world? How does your latest book, on God’s sovereignty, address that? When people ask that question—even I struggle with that question—we aren’t accepting the fact that this earth is wired to be difficult. The rule of thumb is that we experience much suffering because we live in a fallen world, and it is groaning under the weight of a heavy curse. If God being good means he has to get rid of sin, it means he would have to get rid of sinners. God is a God of great generosity and great mercy, so he is keeping the execution of suffering. He’s not closing the curtain on suffering until there is more time to gather more people into the fold of Christ’s fellowship. That answer suits me, and I think it would suit others if they stop and think: Suffering is connected to sin; if God were to get rid of suffering, he’d have to get rid of sin, and then he’d have to get rid of sinners—and God is too merciful to do that. Is it different when the cause of suffering is natural? For instance, you might not have control over getting breast cancer. Do you cope differently from someone who has something done to her by another person? Whether hardship is brought on by our own negligence or through the direct assault of the hand of a wicked person, or our own ignorance and misinformed decisions, or our lack of awareness or misdoings, or some catastrophe of nature—these things fall under the purview of God’s overarching decree. A close look at the New Testament shows that God’s sovereignty extends over all these things. God permits all sorts of things that he doesn’t approve of. He doesn’t approve of my spinal-cord injury or my cancer, but in his sovereign decree he has allowed them. I don’t care if you use permit, allow, or ordained; it’s all the same thing. Ultimately it goes back to God being in charge. I don’t think there is a real difference. The greater thing Jesus promises we can do is not the miracle, but the advancement of the gospel, reclaiming what is rightfully his. Suffering is hardship and heartache. It’s one package. Yes, God could have prevented it. He could prevent a thief from breaking in and stealing, he could prevent a wicked man with a gun from firing it, and he could have prevented my cancer. He could have put in my heart: Go get a mammogram. If he chooses to allow these things to occur, it doesn’t mean he’s any less caring or compassionate. His will, purpose, and sovereign design may be a bit more obscure and enigmatic on this side of eternity. When you discovered you had breast cancer, was your reaction different from all your previous experiences of suffering? I don’t fall apart emotionally. There’s a lump. Wow, okay, let’s get this taken care of. I broke my neck. Yikes. What is this going to mean? Okay, let’s buckle down and move forward. I’m the kind of person who cannot allow those emotions to go down the grim path of despair. It’s too deep of a miry pit. I’d rather face life head-on and with full force and take things as they come, learn from those things, and move forward. How should we respond to someone who is suffering? It’s important to follow injunctions from God’s Word: Go to the elders, be anointed with oil, and confess sin. If you feel you need to go to a special prayer service, by all means attend it. Have a pastor anoint you with oil and lay hands on you. After you do, you have to keep on living. That’s what happened to me when I was first injured. I confessed sin and was anointed with oil. Do I sit around for my hands and feet to get the message? I have to live in the meantime. If you feel led to, pray and seek healing, but keep living while you’re looking for the healing. Even if the focus is on living, shouldn’t Christians prepare themselves for further suffering and death? None of us, in our culture of comfort, know how to prepare ourselves for dying, but that’s what we should do every day. Every single day, we die a thousand deaths. We don’t just walk through the valley of the shadow of death when we get a medical report or when we survive a stroke. We go through the valley of the shadow of death every time we say no to our selfish desires. When we say yes to the grace of God, we are learning how to die. This past weekend, I was singing hymns with friends. One of my favorites is “Guide Me, O Thou Great Jehovah,” but the words in the hymnal we were using had been changed. They took out the verse on death: (singing) “Death of death and hell’s destruction, land me safe on Canaan’s side.” They exchanged the wonderfully rich, pithy, deep, hard words with something vague like, “Help me through until the other side.” They extricated those words about death and hell’s destruction. Why do that? We need to learn how to die every day. Suffering does that. It prepares us. Every time we go to sleep, it’s a rehearsal of the day when our eyes will ultimately close and we wake up on the side of eternity. What teachings of Jesus especially help you understand suffering? There’s the portion of Scripture in Matthew 18 where Jesus says, “If your hand or foot causes you to sin, cut it off. If your eye causes you to sin, gouge it out.” Here Jesus, the one who delighted in healing hands that could not work, restoring feet that could not walk, giving sight to eyes that could not see—here he is, saying cut off your hand, gouge out your eyes, if these things are causing you to sin. Jesus underscores his priority that yes, the physical body counts, but it does not trump the health of the soul. When people ask about healing, I’m less interested in the physical and more interested in healing in my heart. Pray that I get rid of my lazy attitude about God’s Word and prayer, of brute pride—set me free from self-centeredness. Those are more important, because Jesus thought they were more important. Inward peace comes with absolute surrender to the will of God. Learn to accept counsel with humility and straightforwardness. This will help you grow closer to God. The reason you feel so agitated is that you do not accept everything that happens to you with complete trust in God. Put everything in His hand, and offer yourself to Him as a sacrifice. The moment you stop wanting things to be your way, you will be free from so much worry and concern. You won’t have to hide anything or make up excuses for anything. Until you reach this point of surrender, your life will be full of trouble and aggravation. So give your heart wholly to God and you will find peace and joy in the Holy Spirit. My God, I want to give myself to you. Give me the courage to do this. My spirit within me sighs after you. Strengthen my will. Take me. If I don’t have the strength to give You everything, then draw me by the sweetness of Your love. Lord, who do I belong to, if not to You? What a horror to belong to myself and to my passions! Help me to find all my happiness in You, for there is no happiness outside of You. Why am I afraid to break out of my chains? Do the things of this world mean more to me than You? Am I afraid to give myself to You? What a mistake! It is not even I who would give myself to You, but You who would give Yourself to me. Take my heart. What joy it is to be with You, to be quiet so that I might hear Your voice! Feed me and teach me out of Your depths. Oh God, You only make me love You. Why should I fear to give You everything and draw close to You? To be left to the world is more frightening than this! Your mercy can overcome any obstacle. I am unworthy of You, but I can become a miracle of Your grace. NOTE: François de Salignac de la Mothe-Fénelon, more commonly known as François Fénelon (6 August 1651 – 7 January 1715), was a French Roman Catholic archbishop, theologian, poet and writer. The expression “will of God” is used in the Bible in two ways. God’s sovereign will is His secret plan to determine everything that happens in the universe. God’s moral will consists of the revealed commands in the Bible that teach how we ought to believe and live. It is the expression, in behavioral terms, of God’s character. It touches every aspect and moment of life: goals, attitudes, and means (why, how, and what). It is fully revealed in the Bible. It is able to equip believers for every good work. For God’s children, all things within the moral will of God are lawful, clean, and pure. In decisions that are made within that moral will, the Christian should not feel guilty about his choice; neither should he fear that his decision is unacceptable to God. God has made it clear what He wants: His plan for His children is for them to enjoy the freedom that He has granted. In those areas specifically addressed by the Bible, the revealed commands and principles of God (His moral will) are to be obeyed. In those areas where the Bible gives no command or principle (non-moral decisions), the believer is free and responsible to choose his own course of action. Any decision made within the moral will of God is acceptable to God. In non-moral decisions, the objective of the Christian is to make wise decisions on the basis of spiritual expediency. Spiritual expediency, put simply, means what works best to get the job done-within God’s moral will. Wisdom is the power to see, and the inclination to choose, the best and highest goal, together with the surest means of attaining it. In all decisions, the believer should humbly submit, in advance, to the outworking of God’s sovereign will as it touches each decision. God’s sovereignty does not exclude the need for planning; it does require humble submission to His will. Circumstances define the context of the decision and must be weighed by wisdom�not “read” as road signs to God’s individual (as opposed to His moral) will. Such events are determined by God, to be sure, but they are not to be viewed as “signs” to be read. Circumstances must be evaluated, not to determine some clue from God, but to help decide the advisability of a given course of action. Circumstances indicate many of the pros and cons, but they carry no “yes” or “no” tags. Open doors are God-given opportunities for service�not specific guidance from God requiring one to enter. Opportunities, like everything else, come through God’s sovereignty. The nature of such opportunities indicates that most of the time “open doors” should be utilized as part of wise, resourceful living for the Lord. If a greater opportunity or more pressing work is at hand, it is acceptable and proper to pass by the open door. An “open door” is not a direct providential sign from God telling the believer to go in a certain direction. A door is used, not because it is a sign, but because doors facilitate entrance. Considering the concept of “closed doors,” if one were sovereignly prevented from pursuing a plan, and yet the plan itself was sound, one simply might wait and try again later. In this view, a blocked endeavor (i.e., closed door) is not necessarily a sign from God that a plan was faulty. One might accept the fact that he could not pursue it at this time and continue to desire, pray, and plan for the eventual accomplishment of the goal. “Putting out a fleece” is an invalid practice that sometimes works when it is really wisdom in disguise. Ordinary Decisions: One should exercise good judgment and not waste time. Equal Decisions: One should thank God for the opportunity to select from acceptable alternatives, and choose one’s personal preference. Immaturity: One should apply maturity by gathering and evaluating data, devoting sufficient time to the process, giving personal desires their proper place, and basing the decision on sound reasons. Subjectivity: Since God’s moral will has been completely revealed and the means of acquiring wisdom has been explained, the knowledge required for decision making is fully attainable. The believer already has at his disposal everything that God is going to tell him about his decisions. The moral will of God is objective, complete, and adequate. God’s Word does not tell one what to decide in every situation; it teaches how to come to a decision that is acceptable to God. It is from Scripture that we learn the necessity of determining those choices that are both moral and wise. It is the Bible that tells us to acquire wisdom and apply it to our decisions. It is the Bible that tells us where wisdom is to be found. It is the Bible that tells us of God’s involvement in giving us wisdom. It is the Bible that established the objective standard by which we may define and recognize what is moral and wise. It is assumed in Scripture that knowledge of God’s moral will and the necessary wisdom for good decision-making are attainable. The Bible indicates that one’s depth of wisdom and knowledge of God’s moral will certainly will increase progressively over a period of time. The believer is expected to study the Word sufficiently to become personally convinced of its meaning. As he grows in spiritual insight and understanding of God’s Word, his convictions will be appropriately revised, his judgment will mature, and his decisions will reflect greater wisdom. But at any given point, the believer can acquire a sufficient knowledge of God’s moral will and an adequate level of wisdom to make a decision that meets God’s approval. Impressions can come from a multitude of sources. They must be judged by the moral will of God and by wisdom. On the basis of that evaluation, the believer determines his response to the impression. Those impressions that conform to God’s moral will and to wisdom may be followed. The presence of peace or the lack of it may or may not mean a decision is the best. The lack of peace may indicate immaturity, fear of one’s inability to keep a potential commitment, concern about the wisdom of a course of action, or uncertainty about one’s judgment in the decision at hand. The way of wisdom judges the emotional makeup and momentary emotional state of the believer himself as one of the valid circumstances in the situation. That “concerned feeling” should be judged by wisdom. One’s emotional makeup should be judged by wisdom. In the final analysis, every good thing comes from God. So any thought, impression, or feeling that is both moral and wise has its ultimate origin in Him. 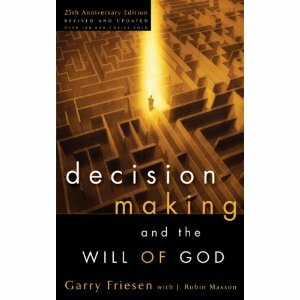 According to the Bible, God is involved in our decision making at several levels. First, He has provided the resources for making decisions that are acceptable to Him. He has revealed His moral will in its totality. He has instructed us in His Word to seek wisdom for making decisions, and has informed us how to do it. Further, He has given us a new nature which makes obedience of His moral will possible. As a loving Father, He has equipped us with everything we need to make decisions that are pleasing to Him. As we work through the process of arriving at a decision, God is continually present and working within us. The words of Paul remind us that “it is God who is at work in you, both to will and to work for His good pleasure” (Phil 2:13). Specifically, His grace enables us to trust in Him (Acts 18:27). He gives the believer the desire to obey His will. By His Spirit, He provides the enablement to keep His commandments. Furthermore, it is God who sovereignly opens doors of opportunity for us. When we ask for wisdom, He gives it through the channels He has established for our benefit. He also answers the related prayers we offer concerning our decisions. And He brings to successful completion those of our plans that are within His sovereign will. Along the way, He utilizes the circumstances and the very process of decision- making to change our character and bring us to maturity. Finally, He works through our decisions to accomplish His purposes – not only in us, but through us. We can trust that if anything more is needed for guidance – such as an audible voice, an angelic messenger, or some other form of supernatural revelation – He will supply it just as He has when it was necessary in times past.